We were always advised to buy only the things we needs more than the things we want. By defining the items we need, we can be able to streamline our finances in order to redirect our money to the needs rather than the wants. Plus, we can also be able to prioritize on these things. So what basically is the difference between needs and wants? Need is something you have to have. This is something you can’t do without. For instance, we need food to survive. Failure to eat means a weak body and we won’t survive. If we don’t have a house, we compromise our safety and more so our protection. If we don’t have clothes, oh my I cannot begin to imagine. Want is something you would like to have. This is not a necessity. We can still survive without the presence of it. This might be a good thing to have but it does not correlate to our survival. 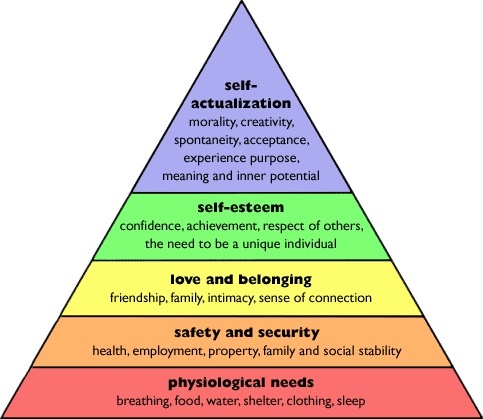 Based upon Maslow’s diagram, this represents that our physiological needs and biological needs come first. This means that in our money and budgeting we must prioritize our needs for foods, shelter and clothing. However is a double chocolate ice cream justified? It can be tagged as food right but is it still a need? When you get that designer shirt, it is still part of our clothing need but can that be counted as well? However, many of us are faced with the dilemma of that confusion between wants and needs. There is always that thin line that tends to combine as well as separate the two. I suggest you use that line in order to justify your purchases. There are physiological and biological needs that go beyond Maslow’s Hierarchy of Needs. There are items that we think of as needed in some way. In line with that, it is important that we get to see and define them and think about it critically from our perspective. That is when defining your needs and wants it is imperative that we get to think of these items for a moment and justify it. I need food. However, going to fastfoods and restaurants would be deemed as a want. I can opt to frugally take food from the house. It will still provide me the same nourishment that I need and can sustain me every single day without the large bill afterwards. I need Internet. My work depends on it. Plus I also get to earn at the same time. However knowing that my job only entails me to access the web and whatnot, I don’t need a higher bandwidth. In that case, I can be able to save up thousands in the process because I know that this little bandwidth can sustain my net needs and my online jobs. I need clothes. But what I need are the items that would make me comfortable and appropriately dresses. Designer ones are considered a want. There are comfortable clothing items that look good on me yet also inexpensive and cheap. Everything that goes beyond those needs and will entail more cost on my end is already considered a want. When you begin to think critically and compare the two, you begin to appreciate the simple things and you realize how much you could be able to cut in the process. For instance, I no longer need my post-paid line since I can live with a prepaid line instead. With that, I was able to save up 1,000 every month. However, this does not mean that you can only buy the things that you need. Life after all is meant to be lived, not survived. That is why, it is also important you get to treat yourself with a few wants. But bear in mind this, do so when you can be able to afford it. Even more, think if purchasing that want can cripple your current financial situation. If you will still have a lot after the purchase, then buy it. If it can eat up a big bulk of your money, then don’t. P.S. To those doing the 52 Week Money Challenge and 52 Week Money Challenge Version 2, it is Week 8 already! Did you deposit the next amount yet?